Brent Miszalski is a SALT Astronomer (SA) at the South African Astronomical Observatory (SAAO) and is part of the Astronomy Operations Team at the Southern African Large Telescope (SALT). As an internationally acclaimed researcher with an NRF B rating, he leads novel research that discovers and characterises binary central stars of planetary nebulae (PNe) and related objects. Together with colleagues he has discovered the majority of known binary central stars of PNe (see below). He enjoys fine tea, naartjies, photography, jazz and occasionally posts to the SALT Astronomy blog. He can be contacted via email using his first name (lowercase) at saao dot ac dot za. Brent in front of the SALT primary mirror. When low mass stars like our Sun reach the end of their lives they eject their atmospheres in one last hurrah, creating a short-lived object known as a planetary nebula (PN). Named after their similar appearance to planets like Neptune and Uranus through small telescopes, they are not actually planets. Planetary nebulae (PNe) are clouds of hot gas and dust being ionized, like a neon sign, by a very hot star, soon to become a white dwarf. PNe are best known for their weird and wonderful shapes, as the Hubble Space Telescope has particularly well captured. 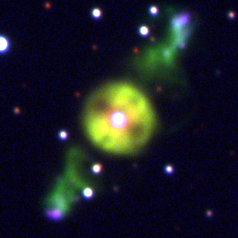 ETHOS1 and its remarkable jets emerge from a binary central star. Stellar evolution is certainly more interesting with two stars.